Tikkio is a mediator service between you as a buyer and organizers as sellers. This purchase is a transaction between you and them. You accept their terms, and you need to contact them if you need the spesific terms. In any case you have no rights towards Tikkio when it comes to refunds etc. Tikkio accepts the following payment methods: Visa and Mastercard. The payment is processed by our supplier, PayEx. The website is secured by SSL-technology, the solution follows national and international security standards and is PCI compliant. Your card information will not be stored by us in any way. Tikkio sells tickets by many different organizers. It's the organizers, not Tikkio, who determine the price of the tickets and the total number of available tickets. The tickets are sold over sales channels like internet and mobile. The organizer reserves the right to cancel or move events. Tickets for a cancelled event are refunded only on the organizer's terms. The organizer is responsible for all refunds. Tikkios commision (4%) is in any case not refunded. It's important to double-check that you have chosen the right tickets before the purchase is confirmed. Tikkio can neither refund tickets that have already been bought nor exchange these for other tickets. Should you have lost your ticket(s) please contact us and we'll let you know what you can do about it. 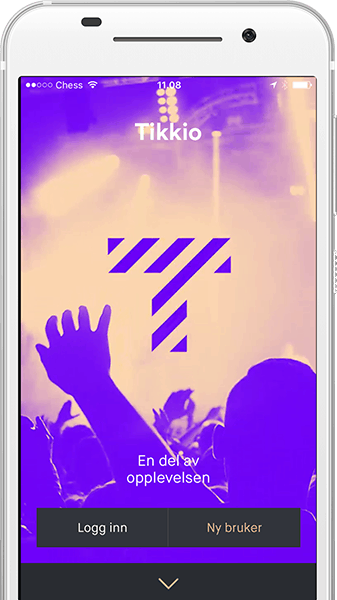 In case Tikkio doubts your user information, we reserve the right to contact you under the phone number or e-mail address you provided before sending your tickets. If we can't get in contact, we will delete your order without further notice. The tickets you reserved can thus be sold to other customers. The tickets will be sent to the e-mail address you provided when you purchased your tickets. The tickets will be sent to your registered e-mail address shortly after the payment has been processed. You can also find your tickets by logging into our website and going to “My purchases“. Angrerettloven (Law of the right of withdrawal) chapter 5 §19 addresses limitations in angrerettsloven. Point b states that: 'Regarding distance selling excluding telemarketing the right of withdrawal does not account for single services if at the conclusion of the agreement the seller commits himself to deliver the service at a specific time or within a specific time span'. Single services that are delivered at a specific time or within a specific time span include theatre, concert or flight tickets. In such cases we refer to the applying cancellation rules. You can register at our website by creating a user account when you're buying a ticket online. Upon completing the process you will receive an e-mail from us confirming your registration. That e-mail includes a link that you can use to change your personal information should you wish to do so. Please note: By using or visiting this website you accept our terms of service. Tikkio reserves the right to change these terms. If the terms are violated Tikkio can exclude you from this website and/or report the matter. By visiting or using our website you agree that you can only do so for your own private use. Without special allowance from Tikkio you are not authorized to distribute, change or use any of the information from the website other than for your own private use. Tikkio holds the rights regarding the content and software of this website. The use of tools to observe or interfere with our website is not allowed. Without special allowance from Tikkio you are not authorized to copy, change, publish or use any of the information on this website except for your own private use. You understand and accept that Tikkio can excluce you from its website without further notice if you abuse or violate the terms of service. Tikkio will report any violation to the police and take up legal measures to receive compensation for potential economic loss or damage. If you store your card information you will be asked to type in your security code to complete the purchase without typing in the card's number and expiry date. The card information will be stored securely at PayEx.